Dr. Jessica Chronowski obtained her Doctorate of Veterinary Medicine from Michigan State University (2015). 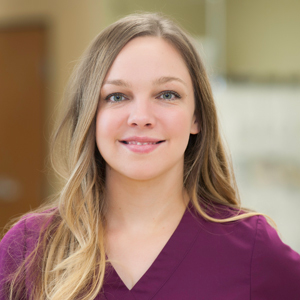 Originally an Education major, Dr. Chronowski got her start in veterinary medicine at the Michigan Humane Society as an animal care technician and quickly realized she didn't want to do anything but care for the well-being of animals. She worked to be promoted to animal evaluator so she could receive hands on training examining animals for both medical and behavioral health. Throughout veterinary school she worked as an assistant at an emergency veterinary hospital in Lansing where she fell in love with the pace and nature of emergency medicine. She joined AEC in 2015. Dr. Chronowski is a member of the MVMA, SEMVMA, IVECCS and AVMA. "I love being able to care for pets and people when they need it most. Emergency visits are stressful to pet parents, and being able to provide them answers and make a pet feel better brings me immense joy. During my time in veterinary school, I lost my own dog after admitting her to the emergency hospital... I understand what it's like to sit on the other side of the table, to feel helpless, to want to do everything you can for your pet. This feeling is something I understand and can empathize with." When Dr. Chronowski's isn't at the office you may find her fluently speaking German or caring for a managerie of animal friends: she has a deaf Great Dane named Henry (and a special interest in giant breeds and the sensory impaired); four cats named Tallulah, Marley, Bruce, and Gus (and an interest for the care and comfort of the stressed feline veterinary patient) and a Blue and Gold Macaw named Cameron (who cracks herself up teasing and literally laughing at the the Great Dane). When Dr. Chronowski was little, all of her reptiles were named after famous rockers!